It is essential to accurately measure what your customers want and to develop breakthrough strategies to serve their needs. The heart of any organisation can be found beating inside the walls of its customer service department. A satisfied customer's positive "word-of-mouth" endorsement is by far your company's greatest asset and most effective marketing strategy. 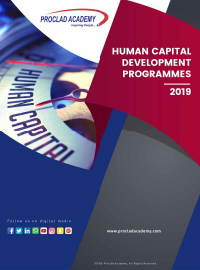 PROCLAD Academy’s Service Quality & Customer Happiness: Building a Customer-Centric Organisation training course gives delegates the best practices, communication skills, conflict resolution strategies, and customer satisfaction assessment tools they require to build a customer-centric organisation. Participants will discover how to use a variety of statistical methods to collect and measure key indicators to identify service quality gaps to improve customer service satisfaction. PROCLAD Academy’s Service Quality & Customer Happiness: Building a Customer-Centric Organisation training course is highly interactive and encourages delegate participation through a combination of lectures, group discussion, practical exercises, case studies, and breakout sessions designed to reinforce new skills. Day 4 - Exceptional Customer Service: Taking Your Organisation from Good to Great! Does your mission statement reflect a commitment to customer satisfaction?